Good Morning!! Above are the prettiest broken dishes blocks! They were made by Linda, my quilting friend...you just have to see them! They are perfectly pieced, and perfectly pressed with swirled centers pressed on the back...the blocks are wonderful! And there are a ton of then, included in her scraps boxes gifted to me. I had some 3 inch squares and placed a few of them, experimentally, in between the blocks...pretty!! I would like to showcase the blocks, more, though...any ideas?? Told you there were a ton of these blocks! Linda made these blocks from the leftover triangles from making flying geese. Cool, huh!?? I cannot settle down and work on anything, restless, wandering this morning...maybe later I will settle down and concentrate on one thing, LOL!!! I made some more 4 inch Jewel box blocks, out of my pre-cut scrap bins...I confess...I love these blocks!! Scrappy and happy, and such a joy to make! I am also making 4 inch stars, so was playing with the two quilt ideas...just for fun. I love that quilt! Her stars were only 3 inches finished...mine are 4 inch finished, and I am having a blast making these stars...no particular time frame in which to get a quilt done out of these... The thing I loved best about her quilt is that she said "I loved making every one of these stars." I just loved that she got so much pleasure out of making her masterpiece! HI Y'all! I have just a little bit to go on this quilt...I hung it back up in the closet about 2 years ago, not quite finished...I am finishing it this week!! The story is...I found the book at the library that had this sampler in it. Another lady (unknown), and I took turns borrowing the book back and forth...until my quilt was together!! I hope hers is done too! High time this baby is finished!!! It is 2:41 in the morning...awake...wide awake!!! I will sure be glad when the thyroid is not raging anymore...I need my beauty sleep in a bad way, LOL!!! Have a super weekend all!!! I made a few more of these 4 inch blocks, today, my second day off in a row! whoohoo! These are such great fun...I will have to be careful not to bore you to tears with nothing but Jewel Box blocks!! I have about 2 hours a day, on my days off , to piece...today, I used that time to cut up scraps into usable pieces. I have 1.5, 2.5, 3.5 and 5 inch strips and blocks. I had such fun cutting these pieces up and planning uses for them!! Hi all! I have been working and my son and his wife were here for the weekend, so I have been a little nutty busy...what's new, right? We had a wonderful time!! Now, for a little quilting time. I have been really enjoying the scraps that Linda and Amy have sent to me...yum! I have cut some of the pieces into 1.5 and 2.5 inch strips, then made the little piece above. I intend for the quilt to be a bed quilt, so I have a lot of scrapping to go, LOL!! The little squares are one inch finished, and the 1/2 square triangles are 2 inch finished. Another Jewel Box! Hurrah!! Can you tell I just love scrap quilting??? I finished my cross stitch BOM...and just love it! I rarely have anything professionally framed, but I think I will have this one framed...I really like it! Have a wonderful day, each one of you!! Can you help Japan on National Quilting Day?? Happy Quilting Day to everyone!! Janet from Quiltsalott and Taniwa, too, are both blogging about quilts for Japan today. As I sit in my safe home, comfortable, not rich by any means but having food and shelter and safety, I was wondering what can I do to help the poor people of Japan. As I see on my TV children, wandering, looking for their parents, orphanages overflowing, shelters maxed out...what could I do? I think the donating to the Red Cross is wonderful, and check, that was done...but what more could I do? I think that the opportunity to send some quilts to Japan is wonderful!! Please visit these two blogs and see if maybe you could send a quilt too!! They both have addresses of agencies accepting quilts, a quilting magazine company. OK! The border had to be made out of 3.5 inch strips, because that is what I had already cut. I considered flying geese, then considered piano keys...but this is what I settled on. I like it! Not overpowering, but fun. I sewed for 15 minutes, then ran around and cleaned house for 15 minutes, then sewed 15 minutes, then cleaned...all day long. The house is sparkly, and the quilt border is done!! Yahoo! This is a great option for those ADD people...set your timer and have at it! You have to concentrate, and it is tiring...but boy, you get a lot done for the time of your day. The border close up...do you like that stripey house slipper...hee!!! Hey, speaking of fabrics talking to us...here are some of the things they say. Plaids say to me, "I belong in a log cabin...take me there!". Florals want to be in a Victorian home. Lines of fabric may be a little stuck up, "We don't really want any outsider... not in OUR click!". Scraps are happy and freewheeling, adaptable...they love anywhere and any quilt!! Some fabrics...even speak the language of love! Seductive, you know..."Hey, I am beautiful...come feel me, don't I just feel so soft and silky in your hand? Hmmmmm???". You know you love running your hand over soft lovely cotton fabrics!!! And those satins, and velvets...now what would they say if they could really talk? Some fabrics even call out to you at the quilt store..."Come buy me! ", they shout! Have a great day all!! I am off to work again!! Do your quilts talk to you?? Do your quilt blocks and fabrics you have been working with sometimes talk to you? Here is a conversation that my fabrics and I had this morning. See above: I had gotten all the plaid blocks sewn together for my Jewel Box quilt. I had a large piece of Burgundy Big Plaid (BBP)...and was just going to sew a large border on of this and be done! Yeah!!! I would be done with the top!!! but then...I heard....from the quilt blocks and fabrics from my quilt....the fabrics started talking!! "Hey...don't you like us? After all, we as your plaids have been working with you in quilts for years...don't you, (tearfully)...like us? Why are you putting HIM (BBP) for the border...and so much of him", the fabrics said reproachfully. "He kind of takes over everything when he shows up in such large quantities!" the quilt fabrics said with a sniff...."after all, I am sure he is a nice person as a fabric, but BBP has such a huge personality...we can only take him in small quantities." OK, OK!! !, I said! All of you plaid quilt blocks stop sniffling and talking and yelling!!! I will not use the big 'Ole hunk of BBP!!!! OK?? But I think he would look nice as an accent border, what do you think, plaids?? "We agree!" said the plaids, "Small quantities of BBP are just great!!! How about you piece the rest of us plaids leftover from the middle of the quilt into a nice pieced border?" Good idea, I think...and everyone was happy this morning!!! So....do your fabrics and quilt blocks talk to you? No?? Hmmmm....really? I tried some other fabrics, in the spirit of using what I had...I can make quite a mess doing this, how about you?? TADA!!! All the plaid quilt blocks are happy...they are just waiting for a pieced border of their friends!!! Have a fun day, all!! Could you help me with something?? If you are a nurse, and a blogger, and a quilter...and I don't have you listed on my sidebar, would you do me the favor of letting me know about you? I would love to list you!! thank you!! I try to keep updated, but I think I have missed some of you...thank you again!! Hey, did you know? MADAME SAMM of Stash Manicure is a retired nurse! Isn't that cool? I have also had the recent privelege of meeting MERILYN and GWARGEDD...both nurses and quilters!! Please see and visit my nursing friends listed to the right...they are fabulously talented!!! Also....it makes me so sad when I cannot answer your questions or comments...Patty Nordahl, Lisa, and others from last post...let me know your e-mail addie and I can answer you!!! Sometimes we are listed as "no reply" on our blogs...you can fix that!! Thank you so much...have a great day, all!! The march of the Tartans!! The plaid jewel box quilt is growing...here are the blocks I have completed so far. Nothing is sewn together yet. I worked the last couple days, so am catching up at home today. Laundry, cleaning, you know how it goes!! I will tell you...this quilt is a wonderful leader/ender idea...or just when you have 15 minutes, you can get an amazing amount done with this pattern!! 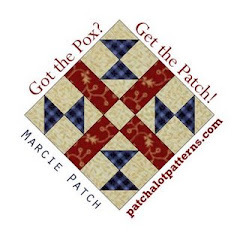 A four patch based pattern...I like it! By the way...do you usually buy a pattern and follow it? I almost never do...although I have quite a few patterns, I buy them for the ideas, then end up tweaking it and making it my own...what do you do? Or I see a quilt and draft the pattern for it....that is fun. I would love to know what you do, and where you get your best ideas!!! Nurses: I am so blessed to work with an incredible group of nurses. It is strange, I am a generation older than most, and almost two generations older than the youngest nurses coming in. I feel very motherly toward the new nurses... The vast majority are ladies, but men are present in this profession too...mostly in the ER and CCU, the guys seem to gravitate to places of high adrenaline, LOL!! One dear nursing friend is just brilliant, graduating high school at age 15, nursing school at 19... Such an incredibly smart nurse...almost done with her master's degree in her very early 20's. Another is zany, wacky, crazy...and just as brilliant. Detail oriented to the nth degree, she is my polar opposite in that way...and she is wonderful. Another? In her 60's...a heart of gold, and still working 60 hours a week like all the rest of us...a dear, dear nurse who really cares. Many years of education, experience and love comprise our staff...I love them all. Plaids are absolutely the best! Have you ever wondered how you are going to use up that box of plaids...you know, the box you sorted out and put in the bottom of the closet? I love my plaids, and have decided to try and use them all up, now that my reproductions are almost all gone. I decided on the jewel box pattern...and I love it so much!! I have an entire quilt cut out...just need some sewing time. It is a surprising fast pattern, all chain piecing, and I love these colors. I don't worry if the plaids are not quite straight, although I do try to cut on the straight of grain. I love to think of some of these older plaid patterns worn by Highland Warriors of old; their family plaids...how much fun!! Somehow I don't think the bright orange is quite traditional...but I could be wrong, LOL!! A dear friend sent my some greens to help finish my Crab Apple Tree quilt, and I had some triangles left over. I paired them with some of Linda's neutral scraps, and tada! A delectable mountains table runner!! I am going to try and finish this soon...probably hand quilting in the wee hours of the night. Cross stitching is so relaxing for me, much more than 20 years ago when I first did this craft...I am loving working on this! I found a neighbor who knits...she offered to teach me!! Hmmm, now when will I fit that in, LOL!! Hey , just something to think about...I recently was invited over to help organize a lady's stash and just generally play in fabric, which is always fun. She is 68 years old, and has some illnesses and health problems. 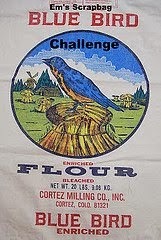 We were to organize the stash into colors, and types, like reproductions, 1930's, brights, and so forth. I was just amazed...following the paths through the house, we went into a room...filled completed from floor to ceiling with tubs and bins and boxes of fabric!!! A whole room!! We worked steadily most of the day...and did not even make a dent. It made me feel so uneasy and just bad...this fabric will never, ever be used up...and more was being bought almost daily. I am not judging her, please know...I know that she must have a big empty place in her heart. A lesson for me though...don't do this!...use mine up!! Give it away...but DO NOT go to any fabric supplying place...unless I need something to finish a project!!! Thus is my lesson for me for the day!!! Thank you so much, all of you...I somehow did not stitch down a "B" on my Beattitudes quilt from last post!! I so appreciate you noticing...and just how did I miss that, LOL!!?? Julie S---I love your beautiful quilt!! HI all!! I just wanted to share what another member of the nine patch swappers group did with her small nine patches...isn't this gorgeous?? It looks so different from my nine patch/churn dash, on point and with such lovely setting fabric...I love this quilt! Julie S has picked out an amazing border print...she has not decided which way to go yet with the border. Can you believe...this is the second nine patch/churn dash quilt she has made!! I am so happy that I finally got this picture on the blog to show you!! Be back later to show you some brainstorms I have been having...almost tornados!! Hope you are having a super day! What are your sticking points?? What is your sticking point in quilt making? Is it the border? (that's me)!!! I dislike applying borders...is it making all those endless blocks? Is is binding? What is it that is your sticking point in finishing the quilt? Since my sticking point is borders, I am trying to make a point to do the border first, piecing or cutting, if I can...that helps a lot! Then this cute birdie heart block for February!! I am loving this...I seem to have more patience for the stitching than I did in my youth....I can't seem to take good pictures of this project...but it is darling! I seem to have turned a corner, maybe, with the hyperthyroidism! I have truly not slept more than 2 hours night for 8-10 months...I was tired, let me tell you! guess what? I have slept 6 hours a night for two nights in a row!! I feel sooooooo much better...Yahoo!! Next lab test is next week to see what if the thyroid levels are down...and I am putting up with the skin rashes that accompany the anti-thyroid drugs...but they itch!!! I can handle that...if the sleeping continues!! !